In unexpected situations, such as a problem withdrawing cash, retention of your card, a technical fault or an act of violence, both the ATM operator and client will appreciate immediate connection with assistance services. With one button and linked to CCTV system, the VOPTech VIPS system s is an ideal solution, which is resistant to vandalism and weather conditions. Bank staff can broadcast through the speaker attached to DP20 through his desktop phone. This solution is also applicable to PRISON, HOSPITAL, HIGH WAY, AIRPORT and LIFT emergency intercom.
. 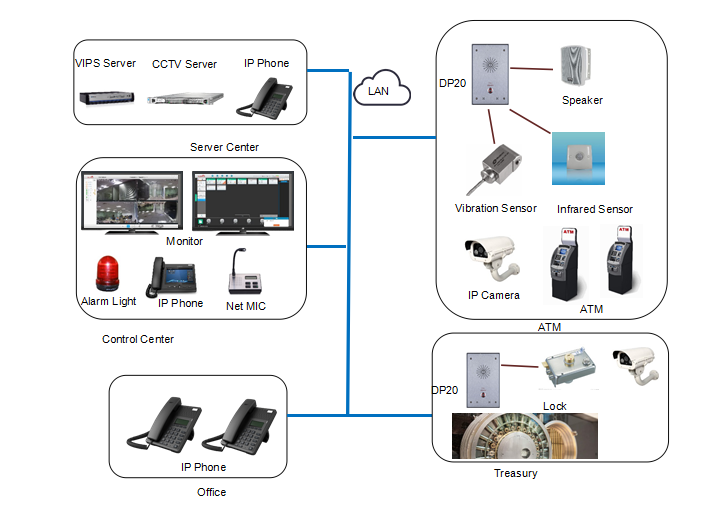 Emergency intercom, video and audio linkage, alarm alert, paging, video and audio recording etc.